It was another beautiful warm sunny Sunday for my photo shoot this week, and I was hoping to encounter a lot more insect life than I did last week. Unfortunately, that wasn't the case. It seemed like only the Honey Bees (Apis mellifera) were out in force. 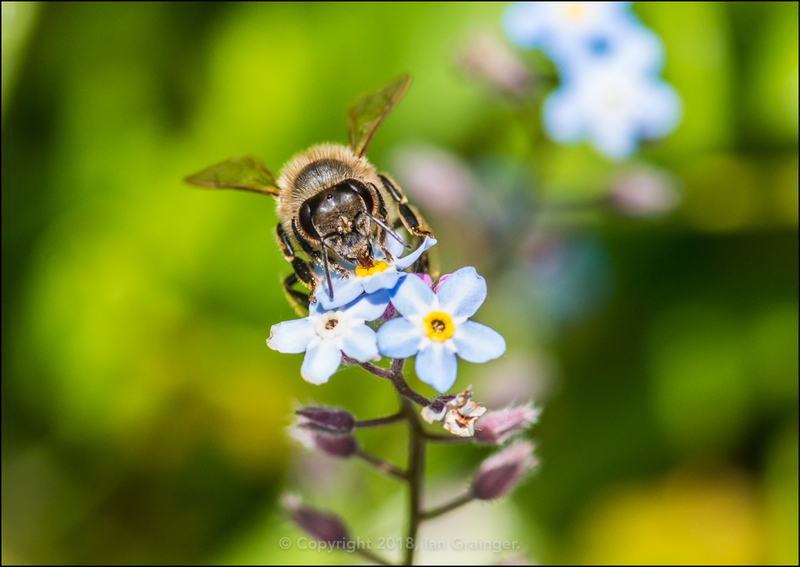 However, I did manage to get a lovely image of one collecting pollen from the Forget-me-nots (Myosotis). 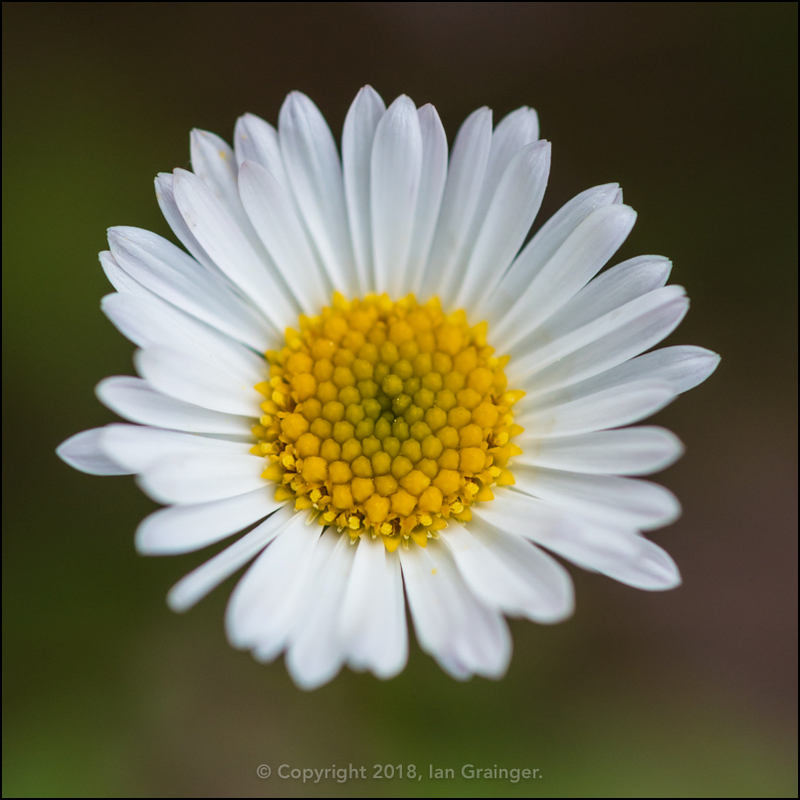 There were plenty of new blooms to keep me clicking though, and the first one I encountered was this Erigeron (Erigeron karvinskianus) 'Stallone', from a plant that had only just seemed to have finished flowering! 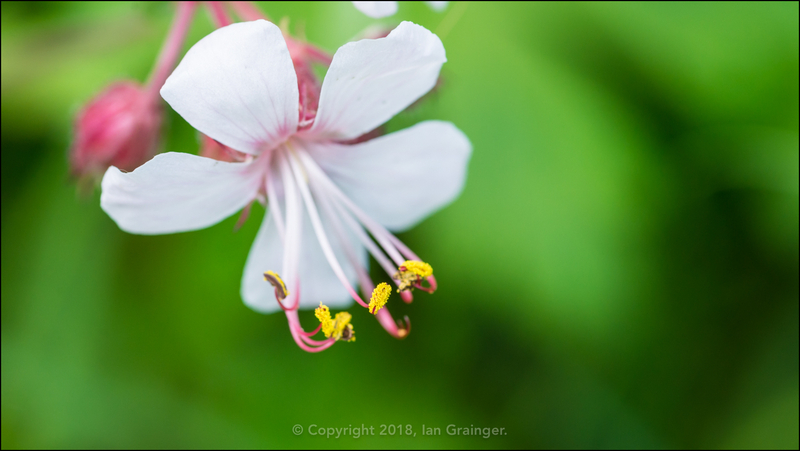 Next were these lovely little Hardy Geranium (Geranium macrorrhizum) blooms, which were popping up all over the place. 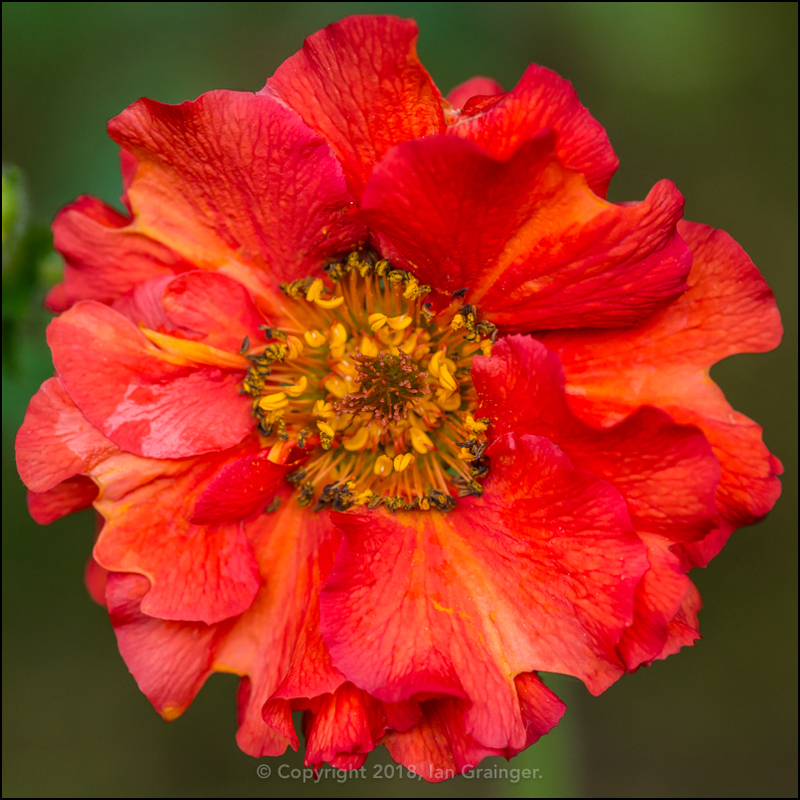 The Geum (Avens) buds from last week had completely opened up into these fiery red flowers, which looked resplendent in the morning sunshine. 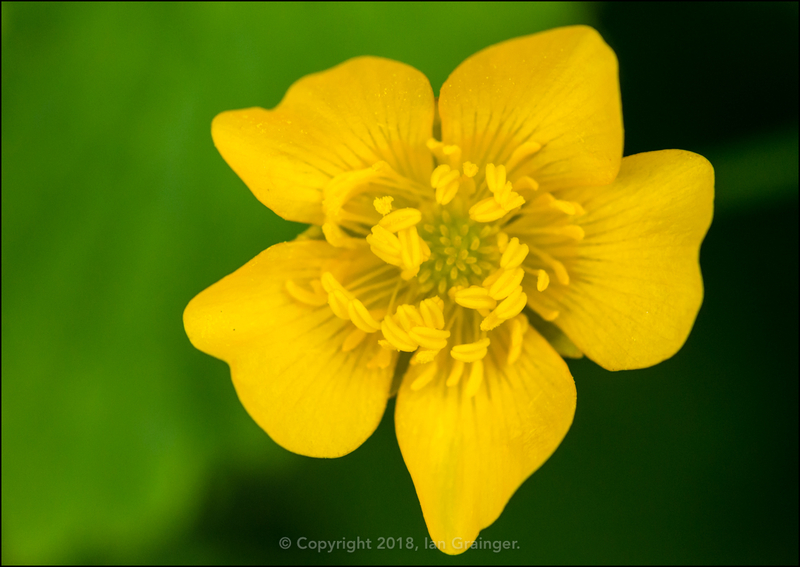 Amongst the cultivated flowers was the odd weed, but I quite liked that, and was especially fond of the bright yellow Buttercups (Ranunculus), as they were usually a magnet for the insects. Just not this week! 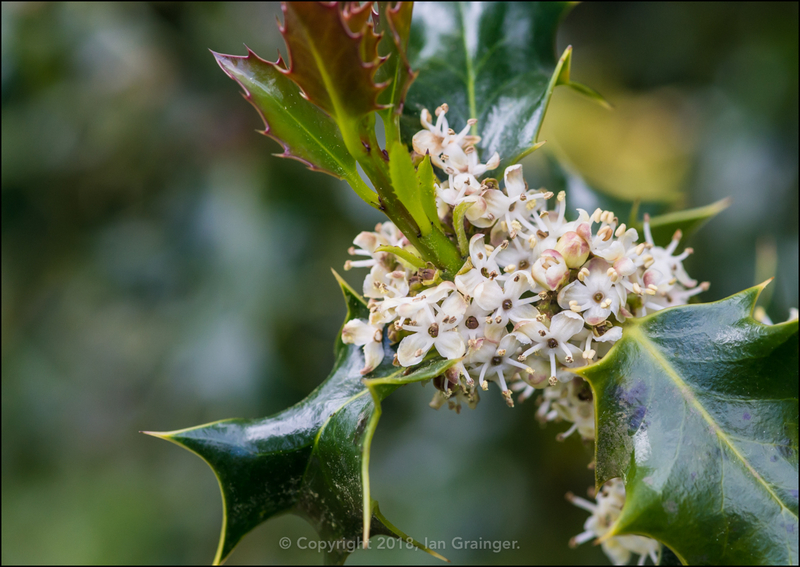 I was also super excited about finding blossom on the Holly (Ilex) bush again. You may remember last November when I saw buds for the first time? Well, they didn't amount to anything. 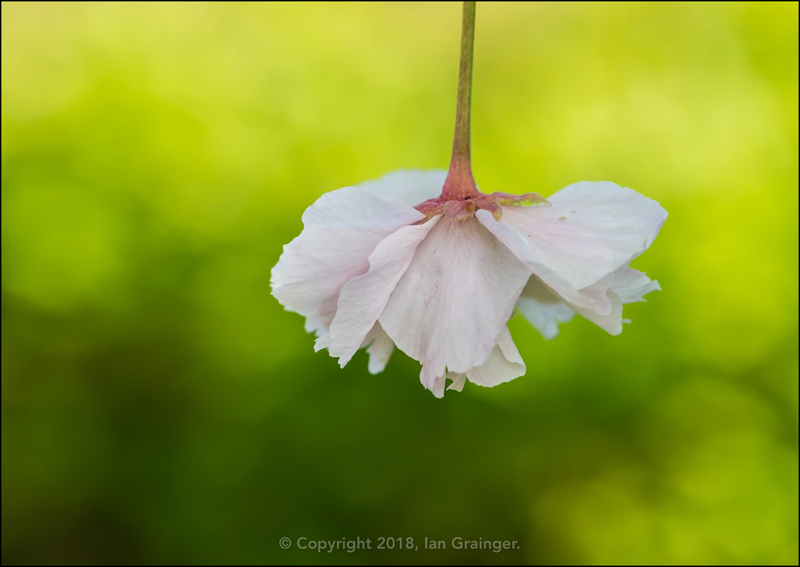 So, I was hoping this latest crop of blossom would turn into berries later in the year. 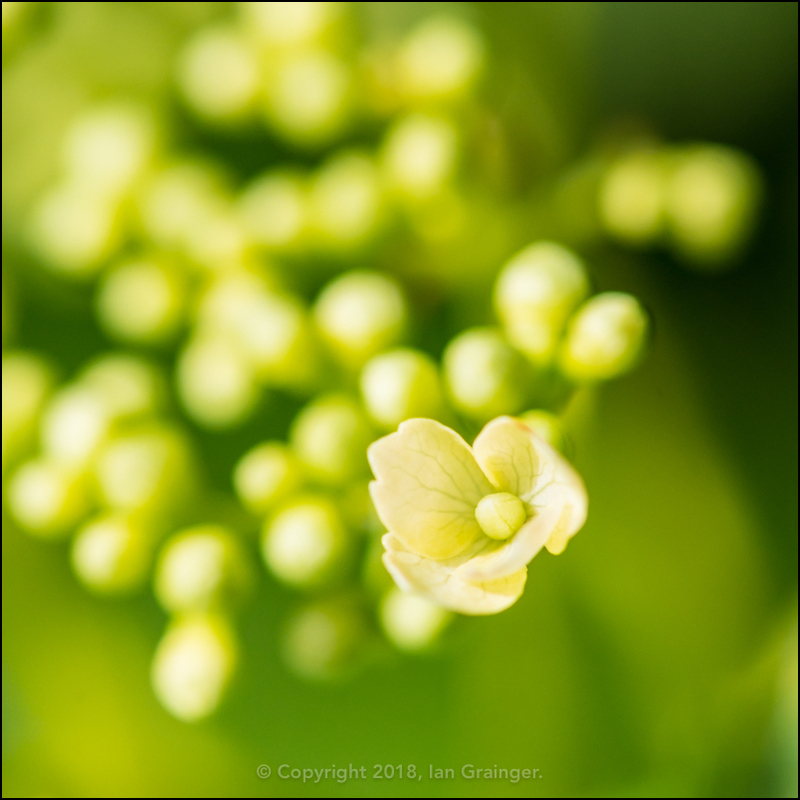 The Climbing Hydrangea (Hydrangea anomala) bush had produced its first bracts, and it looked like many more were on the way. 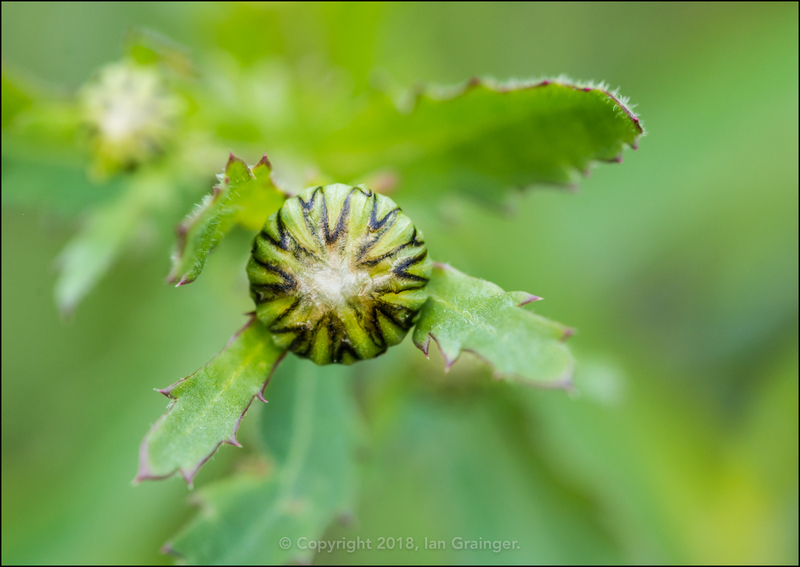 There were also lots and lots of Oxeye Daisy (Leucanthemum vulgare) flower buds waiting to burst open. 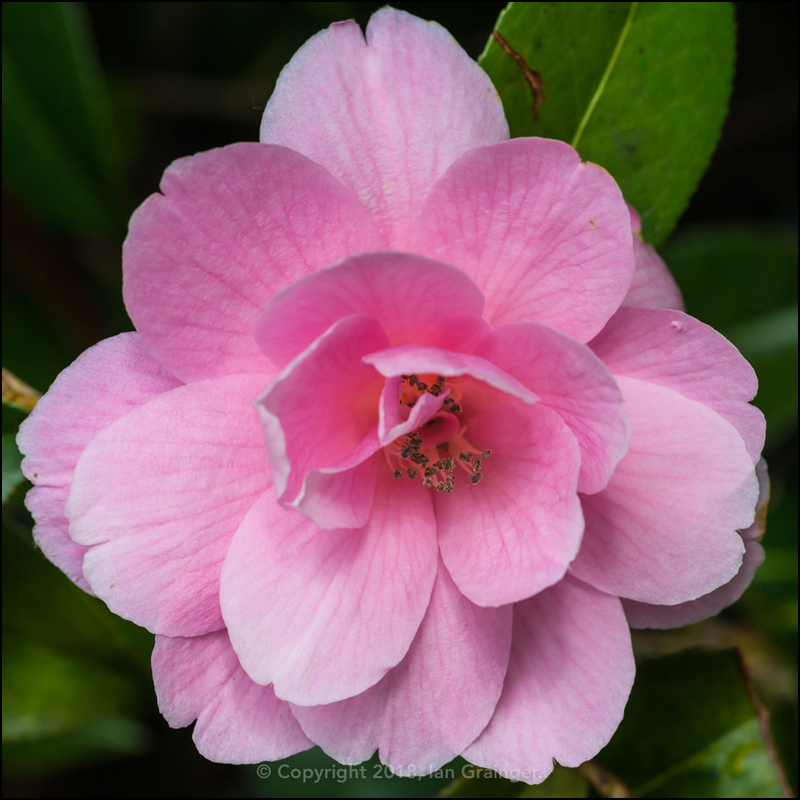 ...and the Camellia bush had finally come to the end of its reign for this year. 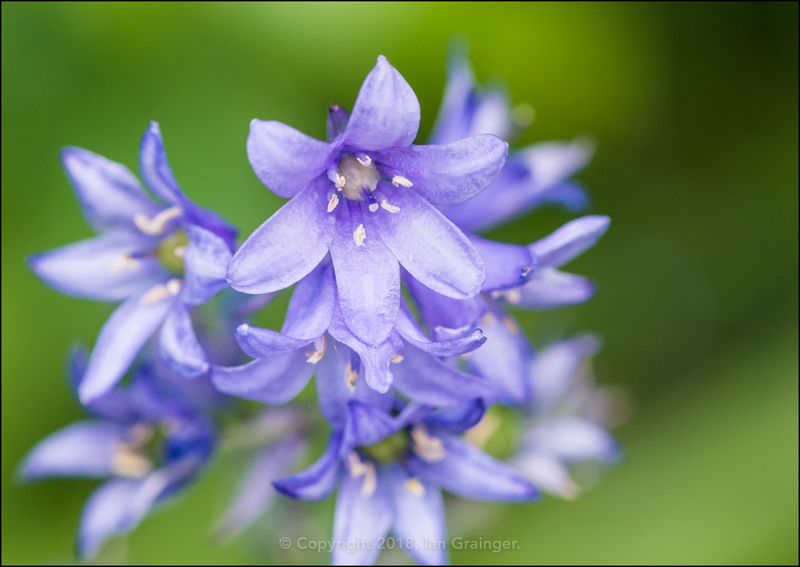 Even the Spanish Bluebells (Hyacinthoides hispanica) were throwing in the towel after a very short flowering period this year. 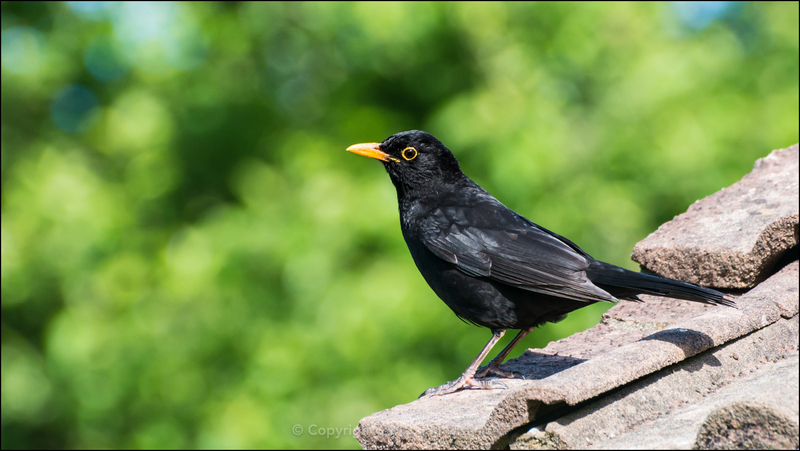 Turning my lens towards the avian community, I snapped this busy Blackbird (Turdus merula) as he made his way around the garden, collecting food for his young chicks. 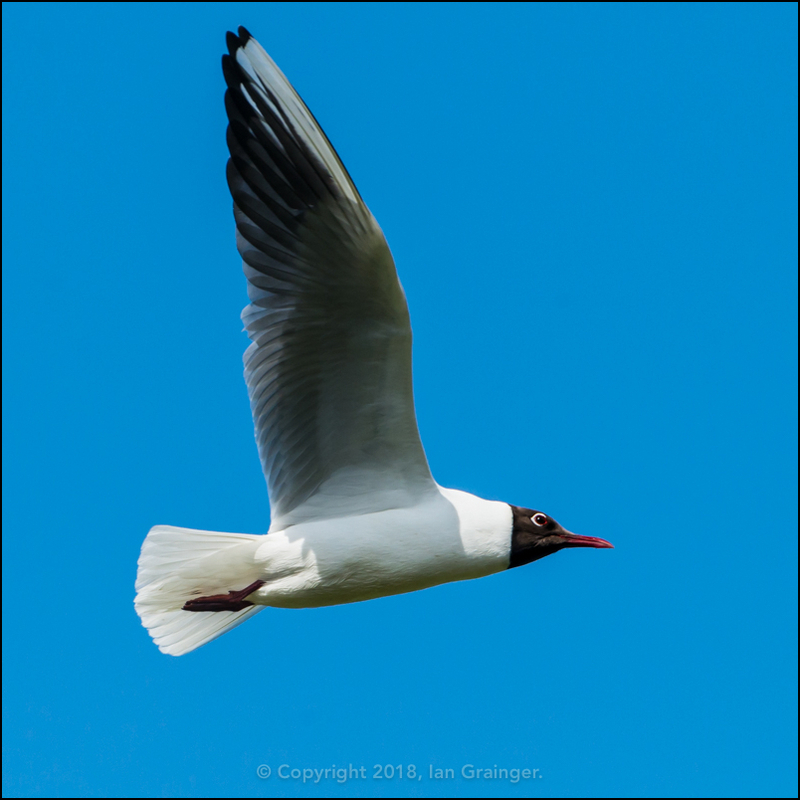 A Black Headed Gull (Chroicocephalus ridibundus) soared overhead through a beautiful cloudless blue sky. 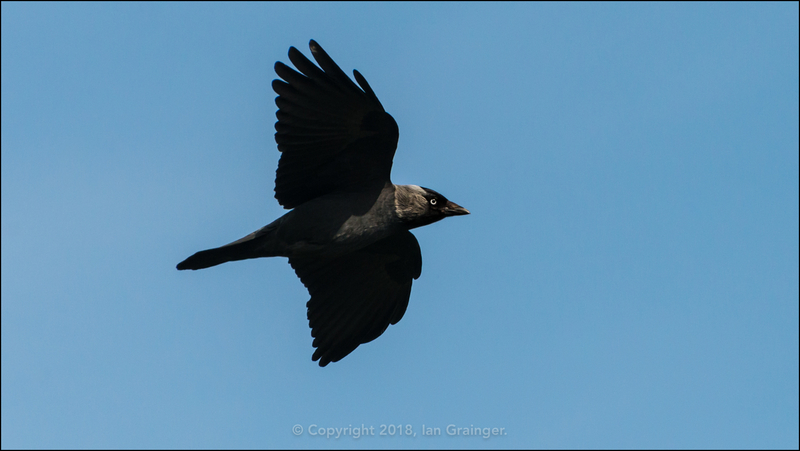 A Jackdaw (Corvus monedula) also passed overhead, looking quite sinister I thought! 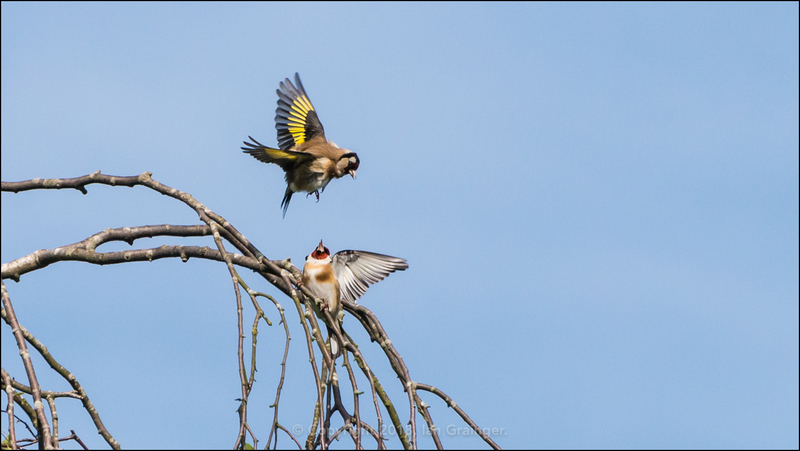 I was quite lucky to catch this skirmish between two Goldfinches (Carduelis carduelis), which I assumed were males, competing over territory. 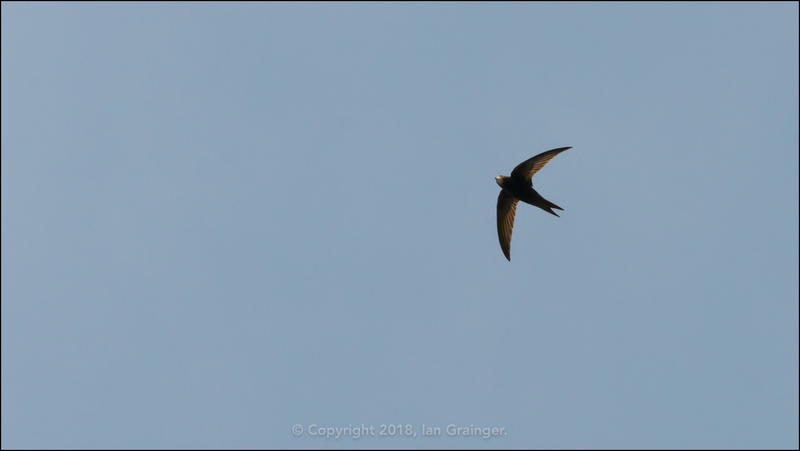 By the time I captured my first Swift (Apus apus) of the year, the skies had turned decidedly greyer, and although the temperature remained high, it looked like rain was on the way. 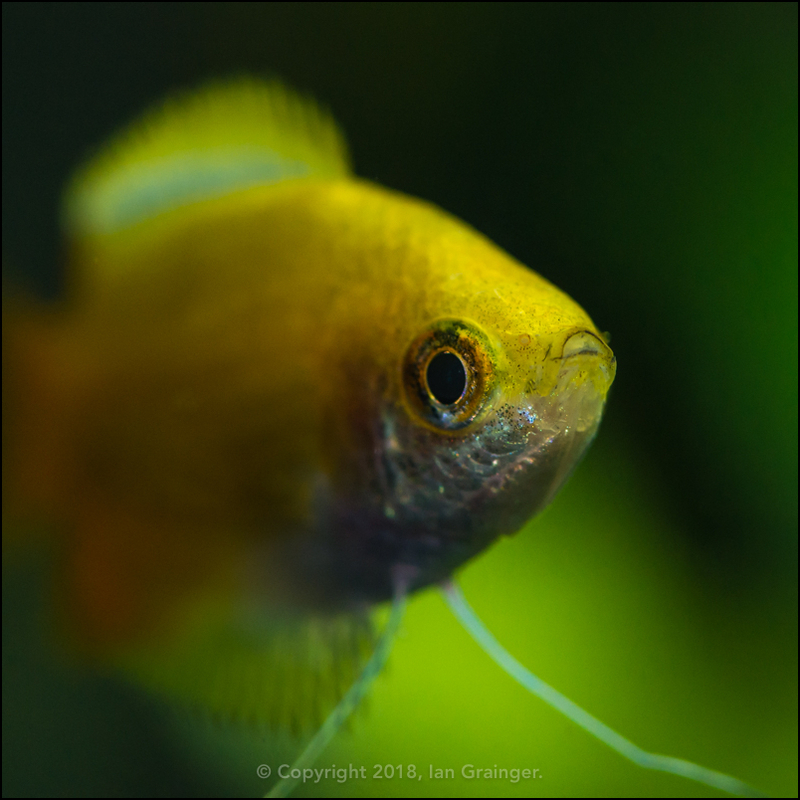 Finally, I haven't had time to shoot any of my fishy friends this week, so here's a shot of one of my trio of Gold Honey Gourami (Trichogaster chuna) that I snapped last month.